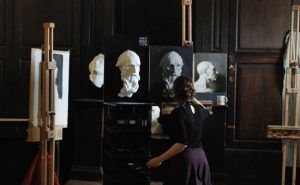 Oil paint can be an amazing substance to work with, from creating quick sketches outside to photo-realistic portraits. Because oil paints take a long time to dry, they give you the flexibility to be able to tweak, alter, soften and blend resulting in lovely muted, smokey subtle paintings. If you decide that you’d like to give oils a go, then my recommendation would be to start with a pre-sized, pre-primed ready-made canvas to paint on. Well, the “oil” in the paint can create a few issues over time you should be aware of. 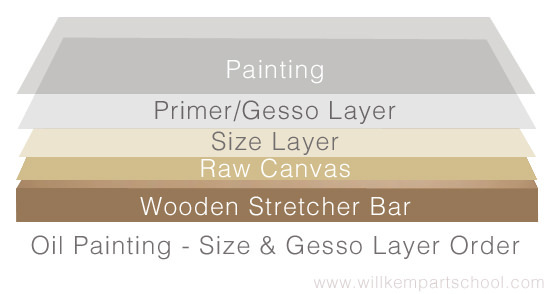 It’s really very simple, below gives you a quick overview of the best preparation needed for a canvas, when working with oils. Over time as oil oxidizes it can make the canvas fibres brittle and more delicate. If you apply a coat of “size” to a raw canvas it acts as a seal between the oil in the paint and the canvas. Just to clarify, a pre-sized and pre-primed ready-made canvas means you’re good to go, you don’t need to do any more to the surface, you can just get painting. 1. A canvas that has been pre-sized but not primed – With this you can either paint straight on top of it, or my recommendation would be to apply a couple of coats of gesso to give a better painting surface. This option is probably for the more experienced painter as it allows you to bespoke your primer (Gesso) application. 2. A canvas that has been pre-sized and pre-primed with an Oil paint primer, also known as a traditional Oil Gesso – This is how a traditional canvas would have been prepared and the Oil primer allows an oil ground and oil paint on top of it. You cannot apply an acrylic ground to this surface. 3. A canvas that has been pre-sized and pre-primed with an Acrylic paint primer, also known as an Acrylic Gesso – This is a modern alternative and allows you to paint an acrylic coloured ground and a thin acrylic under-painting before moving onto an oil paint layer. Why would you want to do this? Speed and convenience as acrylics dry so much faster, some painters like blocking the bones of the painting with acrylics first. N.B. You can paint thin applications of acrylics under oil but you cannot paint acrylics on top of oil paint. You can, of course, buy raw canvas and prepare it yourself. This is more cost effective but time-consuming. PVA Glue – As a student with no money I used to use PVA craft glue for tester pieces. It is cheap, forms a barrier and is great to practice with kids. Cheaper PVA is not the ideal choice as it can become very brittle and unstable over time but you can now get PVA that has been specifically designed for artists. Acrylic Size – To replicate traditional Rabbit Skin Glue, you can use a combination of an acrylic polymer called GAC400 and GAC 100. GAC400 must be applied to raw canvas and will stiffen the fibres first, before then applying GAC100 which is a Multi-Purpose Acrylic Polymer sealer. Applying two coats of GAC 100 before the primer/Gesso layer will reduce linseed oil penetrating into the canvas fibres. Rabbit Skin Glue – Yes you read that correctly, it’s one of the most traditional ways of sizing a canvas and is made by mixing dry glue with water and gently mixing together. It’s one of the worst smells I’ve ever experienced. It’s a laborious and smelly process as you have to apply when warm but for creating a drum-tight canvas, it’s great. However, it is hygroscopic, meaning it will always be water soluble and can absorb water over time. High humidity will re-introduce water into the rabbit skin glue, causing it to soften or swell up. If the painting is in an environment with changing humidity this constant swelling and drying of the film and can become brittle and cause cracking of the final paint layer. Pro Tip: Cotton canvas does not absorb the size as well as linen and will need a stiffer brush and more working into the surface. Oil Gesso – This is a traditional primer and allows an oil ground and oil paint on top of it. You cannot apply an acrylic ground to this surface. Acrylic Gesso – This is a modern alternative primer and allows you to paint an acrylic ground and a thin acrylic under-painting before moving onto an oil paint layer. Can you email me the list of definitive palettes that you were talking about in our lesson the other day. The basic palette was: yellow ochre, light red, english red, raw umber and ivory black. It is based on the primary colours just with everything a bit muted. A more extended palette would include burnt umber, red umber & green umber, possibly Persian red. But as with most things in painting less is often more. Nineteenth-century painter Thomas Couture only used Naples yellow, vermillion, flake white and black. Will, In my world (english trained) light red and english red are the same colour. Could your english red be my indian red? It can be confusing with the paint names, and some brands do cross over but the above colours are from Old Holland paints and their light red, english red and indian red are all different colours. What brand are you using? Sometimes English red can be the same as Venetian red, but wouldn’t be same as Light red or Indian red. Basically you need one warm red, say light red or English red as these colours are very similar and have a warm undertone. And one cool red say, Indian red as this has a purple bias when mixed with white. Hope this helps. 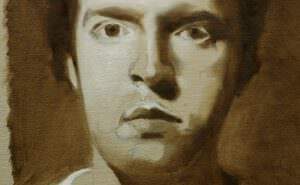 Is it possible to finish an acrylic portrait with a layer of oil paint? i think it should be as I often put a layer of acrylic under an oil painting for a different colour base. Wouldn’t it be the same principle? Yes, you can block in a portrait (or landscape) with acrylics and work with oils on top for a finish. This can be especially useful if you are working on a black background because black oil paint is a slow dryer so having a base with the acrylic would work well. Just be aware not to have the acrylic too thick or the oil won’t have anything to “grab” to. Ideally the acrylic would have been diluted with water so there isn’t as much of a plastic film. Flippet. Im 45 and decided tonight that I want to start painting. Im very creative and can do anything when someone asks me to make something of wood and combining it with paint and still decorate it with stone or whatever. I am constantly considering changing ‘up’ to oil from acrylic. Using the same ‘skills’ I employ, do you believe my paintings, of which I am reasonably/very happy with, will show an improvement? I read that blending is so much more responsive with oil and I do like the transition of colour/tone I see with oil but not sure if I have to learn new technics all over again if I want to change. Thanks for the comment, depending on the way you currently paint the change to oils can be subtle or huge! The process that I teach with acrylics is designed so that when you try oils the same painting principles apply and the change will be minimal. The ability to acheive subtle blends will be very easy with oils, however, if you are used to working very thickly you will notice a massive difference in drying times. It all depends what your end aim is. What style of painting do you currently do? I’ve decided to take the plunge into painting! Your site is certainly very helpful as I decide which medium is best; however, I have a question. What do you think about water soluble oil paint? 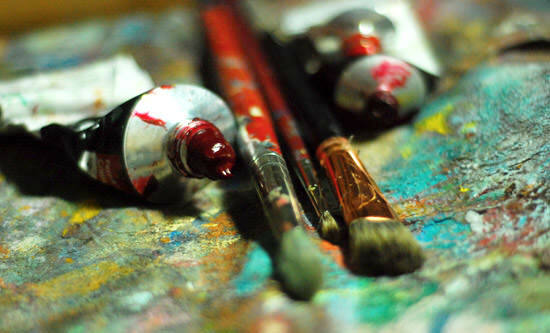 I like the idea of oil paints, but I would like to stay away from the use of solvents. Have you tried this type of paint before? If so, what do you think of it? Glad the website has been helpful. 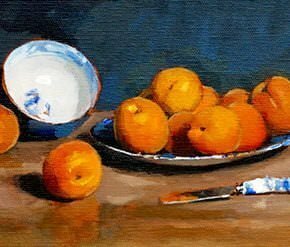 I personally have always used traditional oil paints so I can’t give a full rounded view of water soluble oils. I have tried them and the biggest bonus is for painters who have allergies to solvents etc.. They feel similar to standard oils however haven’t got the pigment strength of artist quality oils. Holbein’s Duo Aqua Oils are really nice and get good reviews, they are definitely worth a try to see how you get on with them. Tia brings up a point that has kept me in acrylics and held me back from oils for a long time…the issue of solvents. I enjoy figure and portrait drawing and have finally decided to try painting, but blending like I would need to with acrylics is useless. Have you or your colleagues tried any of the new non-toxic brush cleaners like Flush Brush? I’m wondering if this could be the tipping point into oils for me. Thanks. I enjoy the palette tips as well! I’m a self taught amateur artist, have been for years. Recently I painted a 3’x4′ portrait with a background of cobalt blue and ivory black. (I rarely use black.) I was horrified when it dried to find what your glossary termed “sinking in”. In various different light, it seemed to appear very dull in areas, and very glossy in others. Not knowing why, I tried to correct it, but nothing I did worked. I’m hoping you can give me a workable solution, and at the same time perhaps it will help others as well. Thanks! Your website is a God-send! Hi Laquita, sinking in can cause the exact symptoms you’re describing. The remedy is to ‘oil out’ there is a description of the process on the glossary, albeit brief. You can watch a video demo of the process here you’ll have your painting glossy as new in no time! Hello again Will…I meant to ask you another question concerning glazing. Could you give me a basic list of transparent colors I might need for glazing, or point me to another link? I believe I heard someone say there’s an indicator on the paint tubes, but many of mine are old and unreadable. Hi Laquita, on most artist quality paint tubes there is an actual swatch of paint, this is often painted over a series of black lines so you can judge the transparency. Mixing in the colour with black is a good choice for creating some lovely muted greens. I hit a bad patch with my portraits turning chalky, I use a limited palette of Ivory Black, Yellow Ocher, Vermillion, Cobalt Blue, and Titanium White. Are some areas chalky and others glossy? I’ve been painting with oils for a couple of years now, and recently discovered that the canvasses that I used to love working on (which I bought from a private “canvas maker”) started cracking after a couple of years. Now I’ve resorted to buying artshop canvasses, but find that they seem to “dry out” the oils and blending becomes quite challenging (even Winsor & Newton canvasses). Am I supposed to size and prime these already prepared canvasses? Or do I perhaps just cover it with a layer of gesso? Yes you can apply an extra coat of Gesso to the already primed surface, this will help to reduce the absorbancy of the canvas. 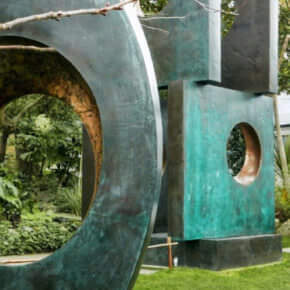 Another option is to apply a coat or two of an acrylic medium first like Golden GAC100, which will reduce linseed oil penetration into the canvas fibres to make the surface more non-absorbant. Then maybe apply one very thin coat of gesso on top for tooth. That should reduce absorbancy to a minimum. I used oil paints to paint over an old painting – I could not remember if I used oil or acrylics for the original – now the oil paint is peeling – is it because the original was acrylic? How do you tell if a painting was done using oil or acrylic paint (years later)? You can paint oils on top of acrylics, but not acrylics on top of oils. The problems will occur if the existing painting is quite a thick application of paint and a smooth shiny surface, the remaining layers won’t have anything to ‘grab’ onto and gives a lack of adhesion. One simple way to test if the painting is oil or acrylic is to smell it! I painted wayyy back in the mid 60s while in high school. I would like to try my hand again just for fun. I used oil then, but the effect I ended up with was extremely smooth that it actually looked like chalk. I brushed it out a lot. My question is, should I try using acrylics this time around? Hi Angela, you might be interested in this article that looks at the pros and cons between the two mediums. Hi. I just painted a gorgeous sunset using oil paints on a cheaper pre-made hard canvas. I did not prep the board before painting, but would like to know how to seal my canvas on a budget. I’ve had teachers tell me a mix of glue and water will suffice. True? Thanks! Hi Rhea, I wouldn’t reccomemd a glue and water mix as it will prevent the oxidation drying process of the oil paint. This is a great site. I painted regularly up until about 15 years ago. At the time I was working with gouache and acrylics. I’d like to start again, and I’ve been interested in doing some encaustic painting. It seems like for encaustics, along with gentle, subtle blends of color that oil might be the medium of choice. A few friends have recommended playing with acrylic modeling paste and gel media to sort of “imitate” the effects of working with wax and oil. What do you think? Hi Larry, pleased you’re enjoying the site, you can use modelling paste and gels for creating textural effects and building up the surface of a painting, and can use acrylic mediums for transfer techniques to mimic some of the effects available with encaustics. It depends on the techniques and visual effects you’re trying to achieve. Great to hear it Barbie, so pleased you’ve been finding the lessons helpful in your portraiture. Hi Amy, yes, you can use odourless mineral spirits to clean your brushes aswell as a medium for your oil paints, whereas the Chroma incredible brush cleaner is just designed for cleaning your brushes. So you’d need to get some odourless mineral spirits to cut through the oil paint if you want to have a lean layer. 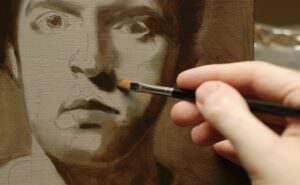 Have a read through this oil portrait series which goes into detail about a classical oil painting process. Yes, I didn’t think the incredible brush cleaner was the same as oms. I went back to the shop and bought some liquin by Windsor and Newton to use as a medium, as they didn’t know what I meant by oms. Anyway, thanks for confirming my suspicious, now to open my lovely new paints and get going :-) Cheers for your help Will, you’re the man! Good one Amy, Liquin is a great medium (it will speed up the drying of the oils) and can be very handy for glazes. (https://www.etsy.com/in-en/shop/ModernHouseArt). It is more heavy impasto style used with palette knife. i tried once paint directly from tube with palette knife. however i could not get much embossed from canvas as susanna paintings. i read about liquin impasto medium to create impasto. but, as im from india, it is not available here. getting it through online too is of no use (shipping restrictions). i also read about adding saw dust to oil paint to create embossing. is it correct? Pls clear me. Hi Vishnu, it is easiest to create heavy texture techniques using acrylics mixed with gels due to the quick drying nature of acrylics. Thank-you for all your very useful information. 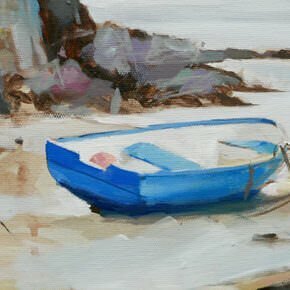 I just have a technical question when using oils- I paint in thin layers and use just a small amount of painting medium at a time, I wait until a layer is touch dry before putting another layer down(about three days), but I sometimes find that it can fairly easily scratch off. Is this a problem? When the painting continues to dry will these layers harden up? and if so should I wait till each layer is very hard before painting another one? (I worry this may take a very long time)..
Hi Carmen, yes depending on the thickness of the paint layers the oil paint can take many months to fully dry and harden completely. You don’t need to wait until each layer is very hard, you just need to wait for the paint layers to fully cure if you intend on varnishing your oil painting. Hi Gerald, you should be able to get an even tone with your oil paints, try diluting with mineral spirits and applying your first layers. Good one Gerald, hope you find the videos helpful in developing your acrylic skills! Good one Gerald, pleased you’re feeling inspired! Very exciting Gerald! hope you enjoy experimenting with your new paints. Hellow Will ,I wish I would upload what I did with acrylics ,it’s marvelous I can’t explain everyone around the pic. is like OMG., 2 to 3 instructions of yours like how to mix acrylics with water …..and a video tutorial pushed me forward to do all these.Thanks to you Will keep it up …and keep guiding us well . Pleased to hear you’re getting great results Gerald. Hi Menchie, yes, the acrylic palette also works great with oils. Loving your website. I need to ask what you think of using greyboard for portrait painting. My question is with or without gesso? Hi Sue, is the greyboard similar to thick card mountboard? I so very realistic work with lots of detail so I am trying to get the smoothest surface possible. I used to work in pencils and am only just converting to oils, so I don’t know much about oil painting. Based on some research though, I used half and half liquitex modeling paste and liquitex gesso and I did around 10 very thin layers, dried and sanded in between each one before I got an ultra smooth egg shell finish. I also used up to 600 grit sand paper for the final sanding. However, when I applied my oil paint it didn’t seem to adhere very well. The brushstrokes were very visible and very shiny as the oil didn’t seemed to get absorbed. When I painted on a normal canvas paper with some ‘tooth’ and ‘texture’ the oil paint flowed on very nicely and was absorbed by the paper and actually seemed more smooth because the brushstrokes sort of ‘melted’ into the paper. I am wondering if I made it ‘too’ smooth? Should there be some sort of ‘tooth’ for the oil paint to catch on to? What do you suggest I should do? Someone suggested maybe it’s the modeling paste, and I am wondering if I just use gesso maybe it would be better? Hi Kishori, If the surface is shiny the oil will be more likely to sit onto the surface. If you imagine a drop of oil on a sheet of plastic and a drop of oil on a piece of paper towel. You then just need to match the level of absorption of your ground to the handling properties you like when painting. The modeling paste is usually used to add texture so if you wanted a smooth surface you could just use gesso. Is the acrylic size you mention the same thing as acrylic gesso, e.g. Winsor & Newton Artists’ Acrylic White Gesso, and could I use this gesso and nothing else to prepare watercolour paper for impasto style acrylic painting? How about oil painting? Hi Lachlan, no, the acrylic size is a modern replacement for rabbit skin glue, such as GAC 100 from Golden paints. For oils on raw canvas you would paint a layer of size first, then a coat or two of gesso. You could use the acrylic gesso on watercolour paper for acrylics without a layer of size, but would have to size the surface for oils. Stumbled across your website earlier this year , found it so interesting decided to have a go at a portrait in oil following your 5 step tutorial – amazed at the results ! I`ve now done several portraits , some better than others but all better than I ever imagined I was capable of.My question is , I`m thinking of glazing over the greyscale portrait but how do I mix a skin colour for a glaze , I read that white is opaque so presumably best avoided ? Any advice. Thanks for your website that has sparked a new hobby for me. Hi Malcolm, nice to hear from you and really pleased you’ve been finding the portrait tutorial helpful in your portraits. You can still mix in white with the colours for glazing, and often you need to paint on thicker than you think. I’m planning a new coloured glazing course for oils that should be out in the new year. Starting with a yellow ochre and a cadmium red will give you a good base colour for the skin tones. Signed up to your website just yesterday. Thanks. I want to start to paint in oils, but has no experience ( except from high school 30 yrs ago :-)) or knowledge on the subject. I went on a two-afternoons Plein-Air class a couple of weeks ago and would like to continue this adventure. My first questions are: what should be my basic color palette (Old Holland), which brushes do I need, how do I mix colors? As I noticed from that class, of course is, the lack of knowledge about how to get the color I needed. Does your acrylic paint color mixing guide also go for oils? Is Richeson oil paint a good alternative for the Old Holland? 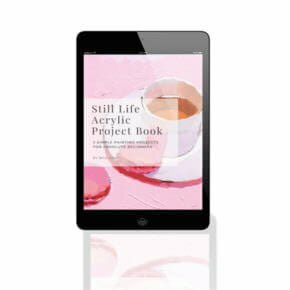 Hi Angela, if you have a look through the website tabs at the top there are a number of getting started articles about brushes, colour mixing and choosing a colour palette. Yes, the same principles from the simple colour mixing course can be applied to oils, some of the techniques would have to be slightly tweaked due to the different drying rates of the paints, but the colour mixing theory remains the same. I was wondering if you could offer any advice regarding a canvas i lovingly streched then naively primed with acrylic gesso WITHOUT sizing first. Should i size the back of the canvas? I intend on working in oils. Can you offer any advice please? So much to learn! Thank you for your generousity. Hi Marie, the sizing layer is more to protect the canvas from the paint above it, so although it would help a little it wouldn’t give you a complete seal applying to the back, so I wouldn’t add it to the back. Personally, I would use that canvas for an acrylic painting and start afresh with a new canvas for your oils. It might not be what you want to hear, but what if this painting is your Mona Lisa, you’d then kick yourself. Hi Laura, the steps would essential be the same, but depending on the wooden panel you’re using you could apply a coat of GAC100 (from Golden paints) to the board first to seal the wood. Sometimes moisture can pull any impurities out of the wood into the gesso layer. A coat of GAC100 seals the wood and creates a barrier between the wood and the painting. Hi Judy, are they oil based wall paints? they won’t be as pigmented as artist quality oils and will have a greater colour shift from wet to dry. Can I use acrylic gesso under oil paint? Hi Dawn, yes you can. I have a roll of Gesso-primed cotton canvas. Can I prime it again with oil primer? Hi Wei, yes, you can apply an oil primer on top. I just finished an oil painting. I want to to if I can change the colors when it dries or will it spoil the colors I already did. Hi Ankita, you can paint ontop of the oil paint even when it’s dried on the surface to alter the appearance and change the colours. I would like to glue a pre gessoed linen or canvas over a failed oil painting on a board. What glue, if any will work? The board has oil paint or patches of oil paint on both sides but the panel is good so I would like to use it. Hi Wayne, you can use a ph neutral PVA glue for attaching linen to a canvas, only issue might be if there is oil on both sides getting a good bond, you could lightly sand the surface of the oil to give a tooth for the glue to grab to. I have been having trouble off and on with my dark mixtures of oils cracking after 3 to 7 months. Sometimes they crack and sometimes they don’t which is making it a problem to discover why. I came across a listing that some colored oils dry faster than others. My thought is that perhaps on occasion I mix the two or three colors that have a different drying time and that I why they are cracking. I paint alla prima, so there is no fat/lean issues and I only have cracking issues with dark paints. I use linseed oil mixed with my paints. What do you think? What surface are you painted onto Mark? you could try a few test samples onto board to see if it’s the canvas movement rather than the differences in drying time. I read with interest your reply on how to reduce the absorbency of store-bought, pre-stretched canvas that has already been sized and then primed with acrylic gesso. I will try the Golden Gac 100 and then acrylic gesso on that to reduce absorbency. 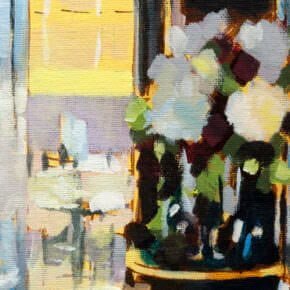 Had read elsewhere of an artist who then puts down a layer of titanium white oil paint to let that sink into the ground to further reduce absorbency and to provide a super bright white ground to let transparent glazes of oil shine through. I have not yet tried this and am wondering what your thoughts might be on that. Thank you! Hi Susan, if you’re working with acrylics, I wouldn’t ever use an oil ground underneath. However, if you’re working with oils on top of an acrylic ground have a look at Michael Hardings non-absorbent acrylic ground, it will stop the oil soaking into the canvas as much. Hi Will, I am starting a new project and I just tinted the canvas in preparation for transferring my drawing and I ran into an issue. I made a neutral (without any white) and thinned it way down to the consistency of milk (i guess). when i scrubbed the paint into the canvas with a big bristle brush, the paint really drank into the canvas quickly. I tried to smooth with a rag but it wouldn’t move at all, it only let me take the very darks off and didn’t let me smooth the brush marks. I am painting in oils on oil primed linen and using spike lavender oil as a thinner. Any ideas? Hi Marco, you should be able to apply another slightly thicker coat on top to even the appearance. You can use an alykd white to speed the drying for an oil ground. Question: A lady has asked if I can repair a small spot of damage on a fairly old oil painting (a family member painted it, so it has sentimental value only), and I want to use acrylics since I’ve used them the past 10 years and am familiar with them. Can I DO that? The damage has not torn the canvas, just basically damaged the paint. I was thinking that if I sand it slightly, or put down a small spot of gesso, that that might work. I’m really good at matching colors, so that’s not an issue. I’d love if you would give me your opinion. Seems most places I looked online had no definitive answer. Thanks! Hi Rosemary, you might have an adhesion problem as its acrylic on top of oil, if it’s sanded back to raw canvas and then build up from a gesso base it would be ok but might be harder to match in the sanded area, personally, I’d be tempted to use an oil to touch in.